Medusahead is a winter annual grass that normally grows 6 to 10 inches tall. It begins growing in the fall and produces narrow, rolled leaves giving plants a slender appearance. One to several stems grow upright from the base of the plant and produce a dense spike of individual florets each with thin awns 1 to 4 inches long. Flowering occurs in late May to June after other annual grasses. The florets do not easily break apart when mature, as the individual seeds fall out, leaving the long thin bristles attached to the seed head. The plants turn from a wheat color to a very light cream color after the seeds disperse. 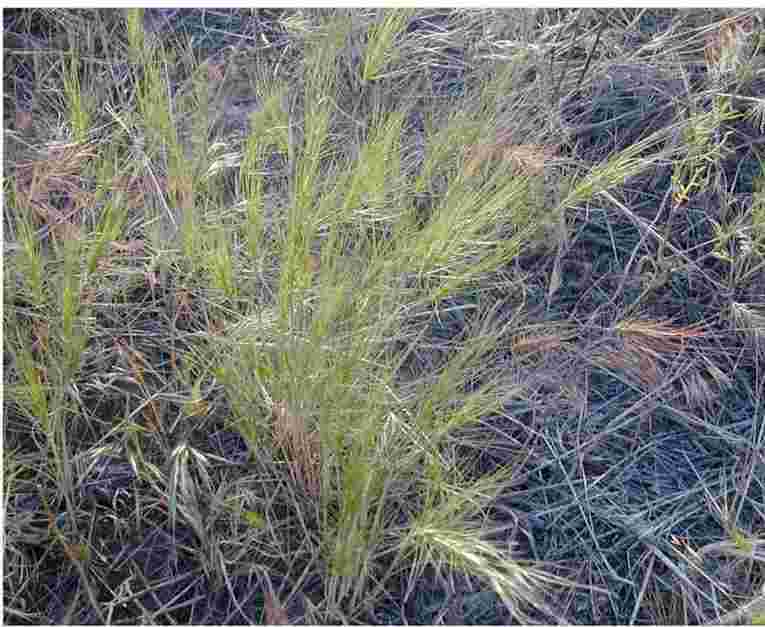 The plant normally contains large amounts of silica, allowing the dead plants to remain in place longer than other annual grasses. Type and Class of Livestock: All classes of sheep, goats, and cattle. Grazing Objective: Graze early in season to prevent seed production and reduce medusahead mulch. Growth Stage for Treatment: Graze winter rosettes in the spring. Palatability drops rapidly as plants flower and mature. Potential Effectiveness: Grazing causes a decline in plant vigor and density after two years of intensive grazing. Very effective if grazed repeatedly and seed production is prevented. Grazing can be combined with a burning, mechanical methods, and herbicides. Bodurtha, T.S., J.P. Peek, Lauer, J.L. 1989. Mule deer habitat use related to succession in a bunchgrass community. Journal of Wildlife Management 53:314-319. George, M.R., R.S. Knight, P.B. Sand, and N.W. Demment. 1989. Intensive grazing management on annual range. California Agriculture 43:16-19. Hilken, T.O., and R.F. Miller. 1980. Medusahead (Taeniatherum asperum): A review and annotated bibliography. Agricultural Experiment Station Bulletin 644, Oregon State University, Corvallis. Lusk, W.C., M.B. Jones, D.T. Torell, and C.M. McKell. 1961. Medusahead palatability. Journal Range Management 14:248-251. Major, J., C.M. McKell, and L.J. Berry. 1960. Improvement of medusahead-infested rangeland. University of California Agricultural Experiment Station. Leaflet 123. 6p. McKell, C.M., A.M. Wilson, and B.L. Kay. 1962. Effective burning of rangelands infested with medusahead. Weeds 10:125-131. Miller, H. C., D. Clausnitzer, and M. M. Borman. 1999. Medusahead. In: R.L. Sheley and J.K. Petroff [EDS.]. Biology and management of noxious rangeland weeds. Corvallis, OR: Oregon State University Press. p. 271-281. Targeted Grazing Committee of the Society for Range Management. Visit www.rangelands.org to learn more about SRM and our work to manage and conserve rangelands.